Paris/New York: Design Fashion Culture 1925-1940, a new exhibition at the Museum of the City of New York, focuses on the French influence on New York throughout the second quarter of the 20th century, and includes some wonderful food-related content and imagery. While much of the Parisian influence is acutely demonstrated in fashion and design, French haute cuisine came to the fore at that time as well. 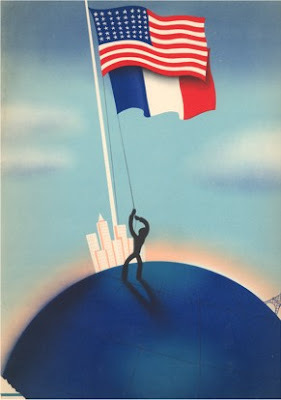 In an essay from the accompanying exhibition book, NYPL's own Amy Azzarito argues that the French chefs leaving Le Havre, France on the S.S. Normandie for the French pavilion at the 1939 World's Fair in Queens, acted as harbingers of the cuisine to come. The French pavilion restaurant was one of the biggest attractions at the World's Fair, and the menu alone -- which is on display at MCNY -- is a stunning piece of art. When the Fair ended in 1940, Europe was in turmoil and many of the chefs had no choice but to stay in the States. Henri Soulé, the manager and ringleader of the World's Fair pavilion, was in the same predicament. With a nod to the success of the French pavilion, Soulé opened Le Pavillon in 1941 on East 55th Street, with many of the original French chefs in his new kitchen. Le Pavillon became one of the most celebrated and talked about restaurants of the 20th century, as much for the food as for Soulé's infamous personality. Soulé ran the show sternly, and those he didn't like were simply not welcome. The patrician families of New York, however, frequented Le Pavillon as much as their own kitchens -- the Kennedy family being one of the most visible. But when Joe Kennedy and Soulé had a much-publicised feud, the Kennedy's took to eating at Le Caravelle instead. The two most famous chefs to emerge from Le Pavillon -- not totally unscathed -- were Pierre Franey (who was also at the World's Fair) and Jacques Pepin, both of whom left the restaurant because of what they felt were unfair practices put in place by Soulé. A menu from Le Pavillon (NYPL's own copy) is also on display at the Paris/New York exhibit. In addition, an abridged version of Azzarito's article is available online through Interior Design Magazine.